Bon Ton’s origin story is not true, but it’s not pure fiction either. It begins with a Vietnamese immigrant named Hoa Nguyen, who made his way to New Orleans in the mid-1970s to start a new life after the war. By 1976 he'd opened Nguyen To Go in the Sixth Ward, a no-frills, nine-seat takeout counter that unified the community on the strength of its Vietnamese-meets-Creole fried and boiled seafood. Twelve years later, when the gentlemen’s club next door closed down, Nguyen knocked down the interior wall and expanded into a full-service fine dining restaurant called Bon Ton. 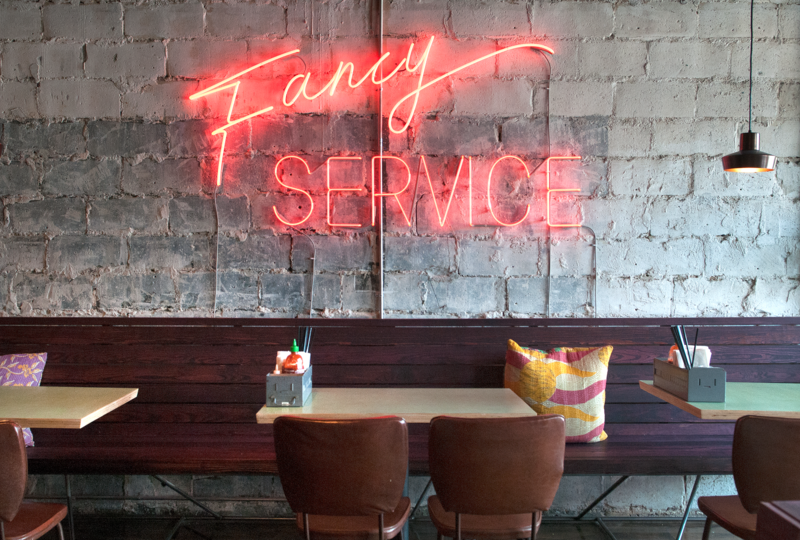 He decorated with his idea of high society: faux marble tabletops, beaded chandeliers, live plants, two neon signs reading “fancy” and “service,” a painted portrait of himself hanging over a pink faux fur-lined corner booth. Crawfish Shack gained a loyal following, earning a 2010 write-up in the New York Times and a visit from Anthony Bourdain. Eventually they knocked down an interior wall and expanded into a full-size restaurant. Sound familiar? No value assignedOne may wonder why the Bon Ton team opted to create a fiction rather than simply sticking with the real story, but that just seems to be their style: a rather twisted irreverence of the Adult Swim variety. Scroll through @bontonatlanta’s Instagram feed and you’ll find a series of weird little videos, all deadpan humor, day-glo clip art and ironic ‘80s beach party vibes. Located just off Ponce in the Midtown space formerly occupied by Top Flr (Carr, a part owner of the previous venture, says the place had a good run — 10 years — but the time had come for something new), Bon Ton's exterior is bright pink, its name painted in wonky letters down one side. A small, golden placard is the only forward-facing signage: “Bon Ton” written in fancy script. Inside, it’s all Nguyen (see paragraph one). No value assignedThe food, a collaboration between Pham, Simpkins, executive chef Matt Floyd and sous chef Eric Brown, matches the décor. Simpkins describes it as “lusty” and the word is apt. “You can eat it with your hands; it makes you wanna drink and have fun,” he says. “Our friends come in and just love it. They’re sweating, wiping their eyes. We almost called the place Hot ‘n’ Easy.” That, too, would have been apt. The menu is a bright orange laminated placemat, dotted with smiley faces and little sketches and broken into haphazard categories like “Tasty Things to Start!” and “Fresh Flavors! !” Lunchtime is easy: the special is a half house po-boy, bag of Zapp’s and can of soda for $10. Go for the Nashville hot oyster roll, overflowing with big fat bellies dusted in chili-laced breading, soaked in hot sauce and buttermilk, tossed in house-made Szechuan oil and served on a crusty Best Bread roll with mayo and pickles. Simpkins’ special sauce — XO blended with a reduction of Pham’s boil — comes on the side. At dinner, your best bet is family-style. Choose from sharable portions of boiled or fried seafood by the pound, raw oysters, sandwiches, sides (shoutout to the crawfish smoked gouda mac and cheese), a number of intriguing Asian-inspired apps like Vietnamese lo lat rolls and charbroiled poutine with sweet potato fries, or the “Crabstravaganza” if you feel like dropping $91 on three-and-a-half pounds of crustacean. No value assignedBon Ton’s classic low country boil of snow crab, jumbo shrimp, mussels, clams, potatoes and corn ($30 per person) employs Pham’s mother’s famous secret recipe, which she’s been serving up at Crawfish Shack since it opened. The only change is that they’ve been able to add back the kaffir lime and lemongrass that fell by the wayside a few years ago due to sourcing issues. Now, with a new purveyor in place, Pham will bring those quintessentially Vietnamese flavors back to Crawfish Shack’s boil as well. The fried shrimp is another must-try, its breading ultra flavorful from the signature Bon Ton sparkle spice blend and the fact that each piece is dipped into the boil before frying. It pairs well with the spicy jicama and papaya salad ($10), a fresh and super-citrusy version of classic Thai som tam, fired up with tiny slivers of bird’s eye chili. Raw oysters were a bit small for the price ($32 for a dozen) but the five-spice BBQ shrimp ($9) were large and slippery with compound butter made from shrimp stock. No value assignedPerhaps the most interesting item on the menu is Pham’s smoked snow crab (market price), an item he used to make only at backyard barbecues for family and friends. A pound of clusters arrives in a large enamel pot, drizzled with garlic butter and imbued with applewood smoke. You’ll need to use the crab crackers, and even then things will get messy (“I’ve washed my hands multiple times since last night,” one of my fellow diners texted me the following day, “and I'm still getting wafts of smoked crab smell”). It’s worth it. “It’s a hot ‘n’ easy time,” says Simpkins. Bon Ton. 674 Myrtle St. N.E. 404-996-6177. www.facebook.com/BonTonBH.